The team at Alzheimer’s Research UK have just used their new modular exhibition stand for the second time at the recent Alzheimers Show held at the Royal Horticultural Halls in London. As a modular exhibition stand, the 6 x 3 metre design can be used to fit a range of size configurations. On this occasion it was used within a 4 x 3 metre space. 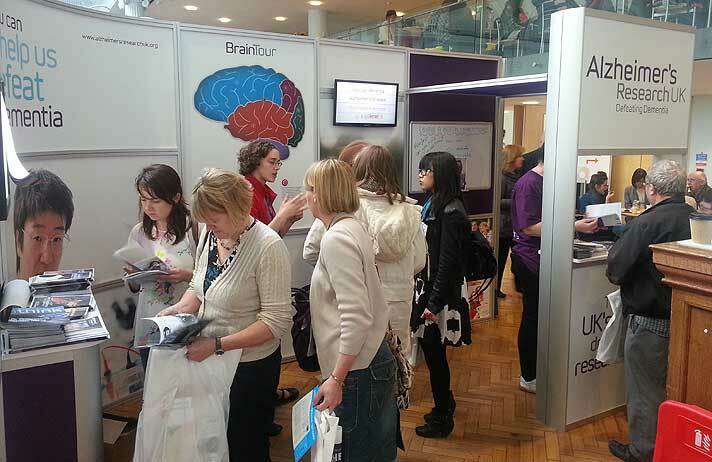 Health professionals and the general public could interact with the illuminated brain tour panel as well as being able to assemble a model brain against the clock and view x-rays on an integral light box.